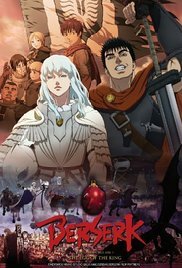 Guts, a mercenary, attracts the attention of the Band of the Hawk and is forced into joining the group after being defeated by its leader Griffith twice. Once the Hawks defeated the kingdom of Chuder's Black Ram Iron Lance Calvary, they are recruited by Midland for its war against the rival kingdom. During one siege, Guts and Griffith encounter the demon Nosferatu Zodd, who notices the Behelit around Griffith's neck and warns Guts that Griffith will be his doom. In time, Griffith's gradual rise in status is ill-received by the noblemen, and a failed assassination attempt by the king's brother Yurius results in his murder by Guts, who was also forced to kill the noble's son Adonis to leave no witnesses. Read more on Wikipedia.